02.13.2005 - This customer was hearing noises in his attic every night. He figured that it was a wild animal, and thus called me. I asked the usual questions about the noises - time of day, volume, amount of scratching, amount of running, etc. From his answers, I suspected an opossum. Rats tend to scurry very fast through the attic and walls, and scratch. Same for squirrels, minus the walls, but squirrels are active during the daytime, rather than the night. Heavier, slower noises at night most likely means raccoon or opossum, and the lack of vocal noises indicated opossum. Also, the customer described slow creeping noises, and that's more like the slow opossum, rather than raccoon. I arrived at the house, put on my headlamp and dust mask, and jumped up into the attic. Sure enough, I saw all kinds of possum sign - from tracks to droppings and even nesting material. Raccoons don't bring in nesting material. Most of the time I set special trapping systems at the entry/exit holes into the attic, but in this case, my attic inspection yielded an animal sighting. I lunged after the opossum, and it took off like a flash! A very slow flash, but as I was inhibited by attic beams, I wasn't able to gain much ground. Finally I caught up with it and it ran up one of the attic beams, which of course led to nowhere. Opossums aren't very bright. I grabbed it by the tail, ready to drop it into the holding cage I'd brought with me, but no, it clung to the beam for dear life. I played a little game of tug-o-war for a while, and even took this photo while doing so. Eventually, my superior tenacity and patience won out, and the opossum let go of the beam and I put it in the cage and brought it out of the attic, much to the homeowner's delight. He was very impressed, especially since I told him on the phone that I thought it was an opossum, and he said that no, this could not be the case. I don't know what made him an expert, but interestingly, over half of my customers seem to be experts. I set traps anyway, just in case their was more than one opossum (there wasn't), and after it was all done, I sealed up the entry holes, cleaned up the possum poop in the attic, and the job was complete. The opossum, (Didelphis virginiana) is a nocturnal animal that lives in North America. It is a marsupial, which means that the females give birth to tiny young, who grow in a pouch. These young eventually cling to the mother's back and drop off when they are large enough. Opossums are unique for many reasons. They have opposable thumbs, prehensile tails, 50 teeth, and several other unusual features. They are omnivores who eat almost anything, they have excellent immune systems, and they rarely live more than 2-3 years in the wild. 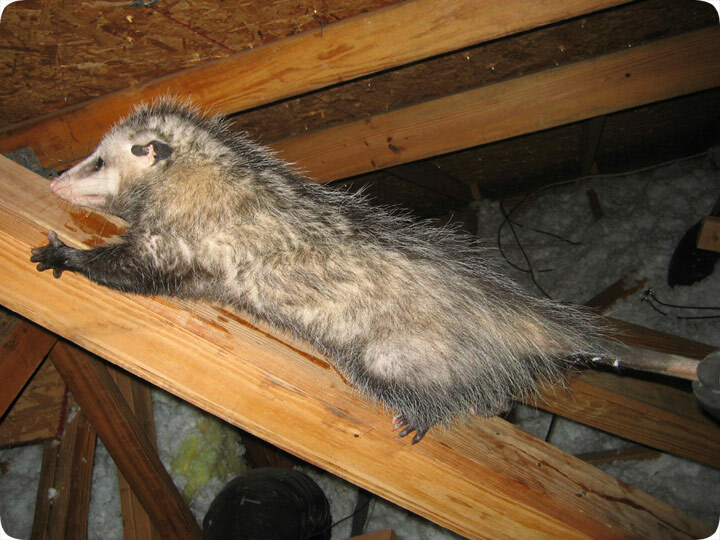 They are most commonly considered a nuisance species when they live in an attic or other structure, such as under a shed, or steal pet food or threaten animals.